Museum-lovers will get to explore Automobile and Fashion Museum and Museo del Vidrio y Cristal de Malaga. 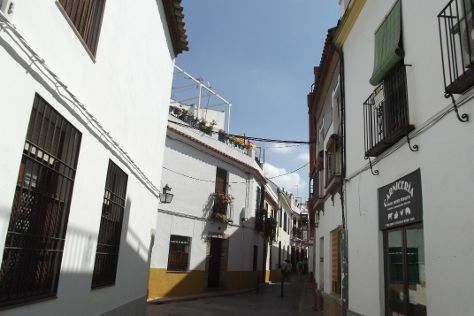 You'll discover tucked-away gems like Mercado Central de Atarazanas and Marbella Old Quarter. Change things up with these side-trips from Malaga: Mijas Magic (in Mijas), La Carihuela (in Torremolinos) and Butterfly Park of Benalmadena (in Benalmadena). There's lots more to do: steep yourself in history at Castillo de Gibralfaro, kick back and relax at Burriana Beach, explore the wealth of natural beauty at El Torcal Natural Park, and admire the masterpieces at Museo Carmen Thyssen Malaga. To find traveler tips, photos, more things to do, and other tourist information, you can read our Malaga travel route planner . Reykjavik, Iceland to Malaga is an approximately 8.5-hour flight. You can also do a combination of flight and bus. The time zone difference when traveling from Reykjavik to Malaga is 1 hour. Traveling from Reykjavik in January, you will find days in Malaga are much warmer (20°C), and nights are somewhat warmer (9°C). Wrap up your sightseeing on the 15th (Tue) to allow time to travel to Pampaneira. Pampaneira is a village located in the province of Granada, Spain. Start off your visit on the 16th (Wed): view the masterpieces at Taller textil Mercedes Carrascosa, then stop by Bodega La Moralea, and then hike along Capileira Mountain Trail. To see maps, ratings, reviews, and more tourist information, read our Pampaneira road trip planning website . Traveling by car from Malaga to Pampaneira takes 2 hours. In January, Pampaneira is little chillier than Malaga - with highs of 13°C and lows of 2°C. 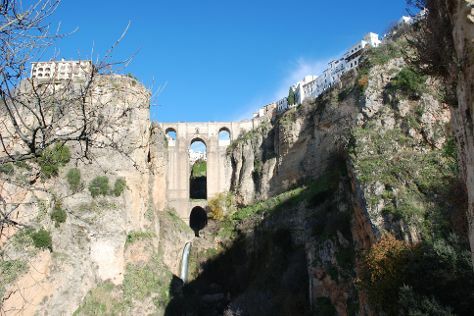 Wrap up your sightseeing on the 16th (Wed) early enough to travel to Ronda. Discover out-of-the-way places like El Tajo de Ronda and Sierra De Las Nieves. Escape the urban bustle at SierrAventura Ronda and Embalses Guadalhorce-Guadalteba. Get out of town with these interesting Ronda side-trips: Ubrique (Ciudad Romana de Ocuri & Capuchin Convent), Castillo de Olvera (in Olvera) and Parque natural de la Sierra de Grazalema (in El Bosque). There's much more to do: savor the flavors at Bodegas Cortijo Morosanto, step into the grandiose world of Castle of Jimena de la Frontera, learn about winemaking at Dona Felisa Winery, and wander the streets of Old City. To find other places to visit, traveler tips, and other tourist information, read Ronda day trip planner. Getting from Pampaneira to Ronda by car takes about 3 hours. Traveling from Pampaneira in January, you will find days in Ronda are somewhat warmer (18°C), and nights are about the same (5°C). 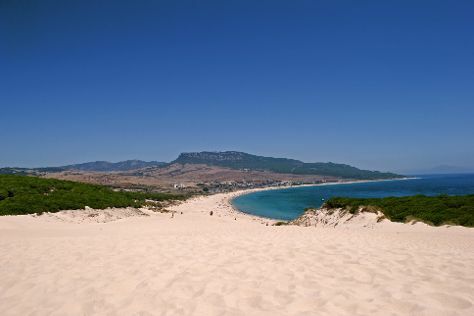 Cap off your sightseeing on the 21st (Mon) early enough to go by car to Tarifa. On the 22nd (Tue), get outside with Landsailing Tarifa, take an in-depth tour of Archaeological Ensemble of Baelo Claudia, and then kick back and relax at Playa Bolonia. Keep things going the next day: view the masterpieces at Atlas Beach, stop by Vejer ArtesanIa, and then enjoy the sand and surf at Playa de Zahara de los Atunes. 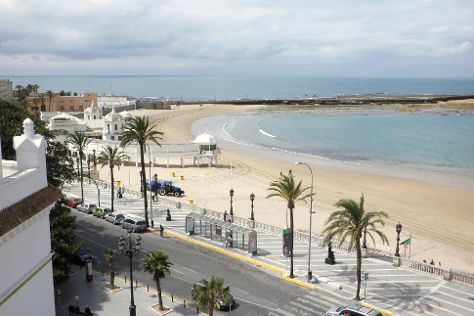 Find out how to plan Tarifa trip without stress by asking Inspirock to help create an itinerary. Getting from Ronda to Tarifa by car takes about 2 hours. Other options: do a combination of train and bus; or take a bus. Traveling from Ronda in January, plan for a bit warmer nights in Tarifa, with lows around 13°C. Finish your sightseeing early on the 23rd (Wed) so you can drive to Seville. Centro Historico de Sevilla and Museum of Fine Arts, Sevilla are good opportunities to explore the local culture. Popular historic sites such as Casa de Pilatos and Archaeological Ensemble of Italica are in your itinerary. Explore the numerous day-trip ideas around Seville: Cadiz (Catedral de Cadiz & La Caleta Beach), Plaza Gruta de las Maravillas (in Aracena) and Tienda Consorcio de Jabugo (in Jabugo). There's lots more to do: step into the grandiose world of Cortegana Castle, take in the exciting artwork at Un Gato en Bicicleta, admire the natural beauty at Jardines de los Reales Alcazares, and make a trip to Plaza del Triunfo. To find ratings, traveler tips, where to stay, and more tourist information, refer to the Seville trip itinerary app . You can drive from Tarifa to Seville in 2.5 hours. Other options are to take a bus; or do a combination of bus and train. Plan for slightly colder nights when traveling from Tarifa in January since evenings lows in Seville dip to 7°C. Finish up your sightseeing early on the 27th (Sun) so you can catch the train to Cordoba. Explore hidden gems such as Roman Bridge and Sala el Potro. Get a sense of the local culture at Medina Azahara - Conjunto Arqueológico Madinat al-Zahra and Perez Barquero Winery. When in Cordoba, make a side trip to see Ceramica Alcaide in La Rambla, approximately 48 minutes away. The adventure continues: get engrossed in the history at Palacio de Viana, explore the world behind art at Museo del Guadameci Omeya. Exposicion de Ramon Garcia Romero y Jose Carlos V. Garcia, take in the architecture and atmosphere at Nuestra Senora de Gracia Church, and browse the eclectic array of goods at Mercado Victoria. To see where to stay, photos, and tourist information, refer to the Cordoba tour itinerary builder tool . Getting from Seville to Cordoba by train takes about an hour. Other options: drive; or take a bus. In January, plan for daily highs up to 17°C, and evening lows to 4°C. On the 1st (Fri), wrap the sightseeing up by early afternoon so you can travel back home.